The ballpark where your favorite team plays looms large overhead, and as you whip out your iPhone to make sure you’re not late, a notification appears: “Welcome!” A few feet closer to the stadium and your tickets to that night’s game pop up on your screen. Your phone knows where you are and it, like you, is primed for some baseball. So how does it have all that information? 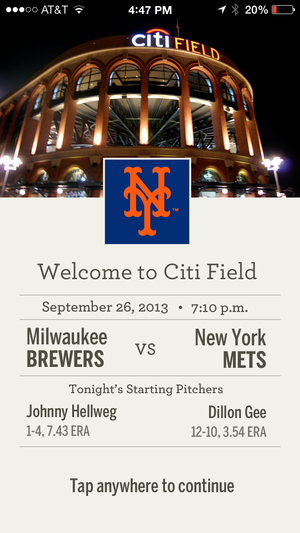 The At the Ballpark app will welcome you to the stadium when you arrive. A little-known piece of technology baked into Apple’s iOS 7 lets app developers place physical touchstones called iBeacons around specific locations. Those beacons can prompt users to take an action or provide information when they are within the beacon’s radius. iBeacons use BLTE (Bluetooth low energy) technology for micro-location information. 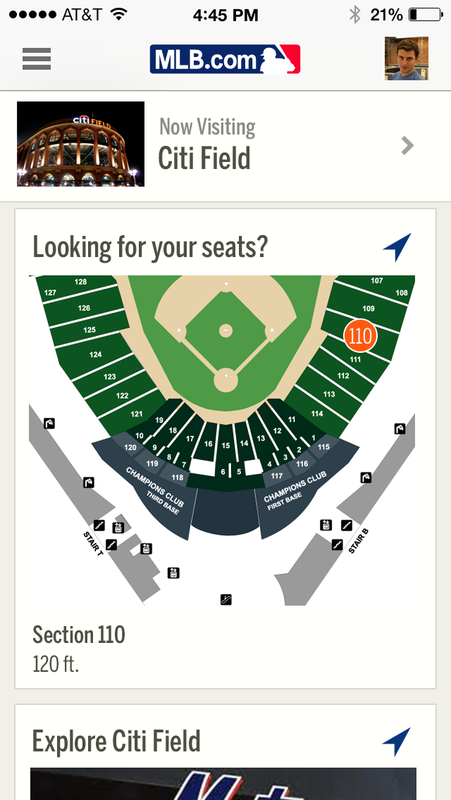 Instead of GPS, which knows where you are in the general sense but couldn’t point you to, say, your reserved seat at the ballpark, Major League Baseball is using iBeacons to offer a hyperlocal fan experience to users of its At the Ballpark app. At the Ballpark is already a hit with baseball fans, but the new features made possible with iBeacons are about to make it more interactive. When the new app debuts on Opening Day next year, At the Ballpark users will see the welcome notification and ticket delivery as well as a seat mapper—yes, turn-by-turn directions to your seat—and discounts on food and merchandise when you’re in the vicinity of the hot dog stand or stadium store. The seat locator wasn't functional during Thursday's demo, but will hopefully keep you from getting lost. The Mets have helped MLB developers test the app at Citi Field over the summer—the beacons have to be refined under normal crowd conditions to make sure they work when masses of people are clustered around. MLB will continue to test and finish the upgraded app during the off-season, then show it to other clubs around the country. Each stadium will have different beacons providing a different experience, and it’s up to each ballpark to decide whether to adopt the new technology. In a Thursday demo of a prototype version of the new app, the beacons worked almost seamlessly—if you have the app running in the background, notifications and coupons popped up when you were close to the beacon so as not to be spammy. (Who wants to see a hat discount pop up when you’re nowhere near the merch store?) The only hiccup was with a beacon that autoplayed a video on the history of the Shea Stadium Home Run Apple when near the apple. MLB is no stranger to new technology. The league was one of the early adopters of Apple's Passbook, which it rolled out to clubs earlier this year. MLB’s interactive team expects the upgraded At the Ballpark app to be ready to go in time for the new season next spring. Batter up.